Home » Website Building » WordPress » How to Remove Unused Shortcodes from WordPress Site? 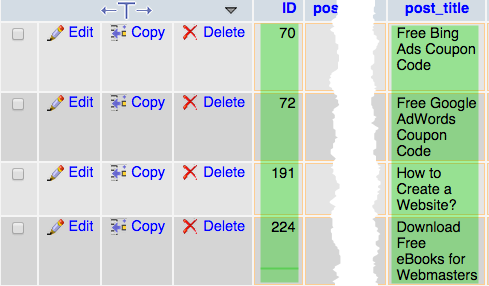 How to Remove Unused Shortcodes from WordPress Site? What you see in the above picture within the square brackets […] are the shortcodes supposed to show the listed content. Since the shortcode plugin is deactivated it shows the actual shortcodes along with the content. In this article we discuss the possible ways of removing the shortcodes from your WordPress site visibly shown to the readers. Again there exist a plugin to hide the unused shortcodes. Install the plugin hide unwanted to shortcodes, enter the shortcode list you do not want to display on a live site and the plugin will hide them from the site. This is a quick fix if you remember the shortcode names. Remember the plugin will only hide the entered shortcodes from the published site but don’t delete them from the database permanently. Here again you need to remember the shortcode names used on your site. Login to your hosting account and navigate to phpMyAdmin section. Select the database of your site and run the below query to delete the shortcode permanently from your WordPress database. Replace [ shortcode ] with your original shortcode. Important point here is that the shortcodes will be permanently deleted from the database. In case if you want to go back to the old plugin or theme then you need to manually add the shortcodes again. Replace ‘shortcode’ with the actual name your the shortcode. Ensure that the shortcode you are hiding is not active (the plugin is uninstalled or the theme is not active) otherwise this will break your site. If you have used the shortcode very few places on your site then need to search the database to get the where used kind of list. To do a search on your database, login to your cPanel, navigate to phpMyAdmin section and go to search tab. Just enter the shortcode you want to search and select the table (select all if you want to search the complete database). You will get a list of matches as below and click on the browse button to see more details. You will see the list of the posts where the shortcode is actually used and edit the post manually from WordPress visual editor to remove the shortcode.